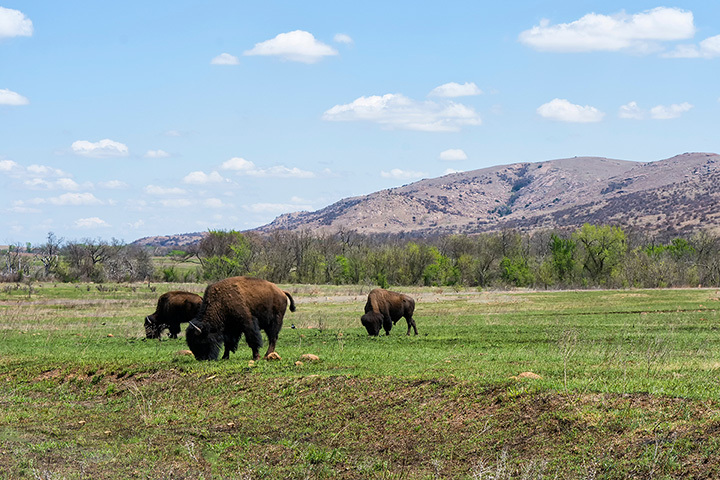 Editors' Picks: 20 of the Best Things to Do in Oklahoma! "Oh…..kalohma....where the wind comes sweeping down the plain." Yup, the Sooner State is an intriguing mix of wild weather and cultural milestones. It's the home of Will Rogers and Route 66, beautiful nature spots and wild cowboy culture. Celebrities from Reba McEntire and Blake Shelton to Dr. Phil and Brad Pitt hail from Oklahoma -here are 20 of the coolest things to do in the state. Those stars have probably done at least one or two of them…. Back in 1908, this cobblestone town opened as the state's first resort. The area is known for its healing powers, and, back in the day, attracted everyone from Al Capone to Bonnie and Clyde (who probably couldn't stay very long). It's considered by many to be one of the prettiest lakes in the state, surrounded by acres of forest. Whether you indulge in fishing, boating, swimming or just taking in the scenery, it's worth a visit. This pretty waterfall on Travertine Creek is a popular swimming spot in the state. The water tends to remain around 65 degrees all the time -perfect for cooling off when the temperature soars. This winding, 54-mile stretch of road is a favorite in the state for leaf-peeping. The dazzling colors of the changing leaves create an "oh, wow" moment around every curve.